Which two nations would qualify for Italia'90 from group 6? Difficult to look beyond Spain. They had lost a few experienced heads, but there was a feeling that a new generation was needed to take them forward, and they would always be natural favourites. 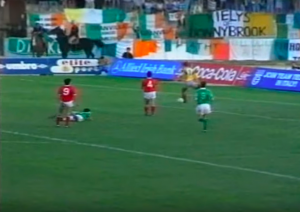 Could the Republic of Ireland reproduce their impressive performances in the 1988 Euros? In that case, they would in fact be the most likely team to progress along with Spain to the World Cup. Football aristocrats Hungary would probably be their hardest competitor, but based on recent performances, the Republic had a somewhat higher level of performance. Northern Ireland could perhaps surprise everyone and qualify for the World Cup a third time in a row, but it felt like they were going through a rebuilding that wasn't the finished article yet. Only Malta were not fancied by anyone to challenge for a place in Italia'90. NIR escape early scare from lively Busuttil, then score three before h-t.
Stalemate at Windsor Park, but the guests look the stronger side. NIR withstand pressure for 85 mins, before Vincze breaks the deadlock for Hungary. Fast and furious in Seville as Spain hit the Irish for two second half goals. Busuttil strikes twice as depleted Hungary are held in Valletta. Northern Ireland hold out for 30 minutes but fall apart following three strikes in quick succession after the break. Without ever reaching their pinnacle, Spain without too much bother see off spirited Malta. Cautious approach and corners give Spain the win. Lacklustre performance by a reshaping Hungary, the Irish not much better. Spain easily deal with ten man Malta, who were all set about damage limitation in the second half after being reduced to ten men on the stroke of half time. Malta left with a very well deserved point, and could have punished the Hungarians on the break even further. Professional job by the Ulstermen. Brilliant battling display secure Ireland their first win. A less enthusiastic Ireland still deal comfortably with negative Malta. Win gives the Republic of Ireland a great advantage over Hungary in the hunt for second place. The Ulstermen show real commitment, but Hungary win by individual brilliance. Big win all but sees the Republic through to Italy. Hungary draw with all-out attack, as Spain qualify for Italia'90. Another comfortable home win to round up Spain's campaign. The Irish dominant from start to finish. Spain had been the bookies' favourites to win the group, and fulfilled expectations. They won their first five matches, by which time they already looked destined to qualify for Italia'90. They were outfought in Dublin, but did in reality have little trouble to keep off Hungary in the two deciders that were lined up for them. The Republic of Ireland ousted World Cup regulars Hungary and N. Ireland to qualify for their first ever tournament. They were slow starters, but hit back with one of the performances of the group when they beat Spain in Dublin 1-0. Essential home wins against Hungary and N. Ireland followed, although they weren't as dominant in these matches as one might suspect. Hungary endured a torrid qualification campaign, where the calamities started with the draw in Malta, as Mezey found many of his best players suspended by the authorities because of an ongoing investigation. His replacement Bicskei did never really find a good shape for the team, nor the right players. An uninspiring win in Belfast set them on track for two possible late deciders against Spain, but even though they managed a draw in Budapest, they were outclassed in Seville. Star players like Détári and Kiprich never performed consistently and the team just didn't look ready for a World Cup this time around. As for Northern Ireland, they would have wanted a stronger campaign. Having got off to a fine opening win against Malta, their undoing was the lack of goals. Whiteside's consolation strike against Hungary at home was their sole goal in six against the three teams which finished above them. The home draw against neighbours Republic of Ireland was probably the pick of their results. The Ulstermen will as a result be missing out on their first World Cup since '78. Malta probably exceeded expectations by taking two points in draws against once mighty Hungary. They also managed to show along the way that they are no longer the push overs that they used to be, and a lot of credit should go to the West German coach. Some of their players had seen good progress during the campaign, and with a relatively young average age, they could be looking to improve further next time around.